Have you ever dreamed of running your very own successful bakery? Click here to play! Now is your chance to bake up sweet treats to bring in plenty of monetary treats in the 3 or 5 reel version of this fantastic game! You'll have to recruit some employees if you want your bakery to take off. Spin in as many blonde men as possible as this charming helper is a wild symbol and will replace most other symbols to help you bring in more wins. Plus, he will award you with the progressive jackpot if you spin five of them across the reels. You'll definitely need some treats. Spin two to five cherry pies to bring in 2500 times your line bet. Two to five bowls of fruit will get you up to 1000 times your line bet. Two to five ice cream Sundays will grab up to 500 times your line bet. There are also cakes, doughnuts, blueberry pies, and cupcakes to help you bring in more wins. Once business is booming, you'll want to recruit more help. Spin two brunette ladies on selected reels and you'll get a number of free spins. If you spin three lovely red heads, you'll trigger the bonus feature for more chances to win. This brilliant game is available as a classic 3 reel slot as well! 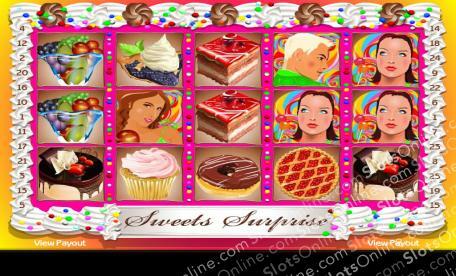 Get your hands in the dough of this game and you could see yourself spinning in plenty of big money treats! The brunette beauty is a scatter symbol. Spin her on reels 2 and 4 at the same time and you will trigger five free spins. The blonde gentleman acts as a wild symbol. He will substitute for most other symbols, excluding scatters and bonuses, to help you bring in winning lines. He will also fetch the progressive jackpot if you spin five of him across the board while playing all 25 lines with a maximum bet of 5.00 per line. When three or more radient red heads appear anywhere on the board, you will be rewarded a bonus prize.